Damn, what a love letter to Lupin this series has been. We got Lupin as he adjusts to a modern age of thievery, having to deal with modern technology as it's used to thwart him at every turn. The main episodes are truly brilliant, balancing humour, action and violence around amazing stories. The side episodes have the obligatory Goemon & Jigen one off episodes, and odes to former parts with episodes based on Lupin’s past, shown by his change in jackets. All of which are truly brilliant, honestly there isn’t a single episode I don’t love. The main cast are delightful as always, especially when showing the relationship and humorous interactions between Lupin & Jigen, and Lupin & Zenigata. The relationship between Fujiko and Lupin is also explored, which shows there really is more to them, other than flirting and trying to get one over on each other, plus might I add ‘pervy moment warning’ damn does Fujiko look especially good this season. The final arc also does an amazing job of examining the complicated relationship between Lupin & Goemon. The series also introduces a new brilliant young hacker called Ami, who is an amazing addition to the cast. Overall Part V of Lupin III really is a brilliant series, that has taken all the best parts of Lupin and made something truly magnificent. There's this tendency among Lupin enthusiasts to praise every iteration, giving it special treatment, regardless of it's faults. I'm one of those enthusiasts so forgive my sense of bias. What makes a Lupin III series fun is in capturing the magic of watching the titular character and his crew of thieves do whatever the hell they want and getting away with it. Parts 1-3 as well as the specials and movies used this in episodic adventures about kinetic fast paced heists and rescuing princesses and saving/destroying countries. Part 4 is where that format changes and I'd say for the better with an overarching plot. And don't get it twisted, those episodic adventures are fun, but each episode feels like a slightly different Lupin depending on what his goal for the standalone adventure might be and who's the writer and episode director staffed to work that day. Remember how episode 4 and episode 21 of Lupin Part 1 are BOTH green jacket series Lupin entries? The overarching plot allows us to finally spend more in continuity time with Lupin, less about the cathartic payoff of watching hundreds of scores and plans come together, but witnessing the struggle in accomplishing a grand heist. Part 4 also started the trend of introducing characters that act as recurring foils/sidekicks in order to create new situations for our criminal mastermind. Part 5 is like Part 4, except instead of watching the struggles of a quasi married Lupin, we watch the struggles of a quasi internet famous Lupin. The series smartly has Lupin be quite handy with cyber security and the modernities of stealing valuable items in the age on the brink of a technological singularity. However, he's not adept enough to beat hackers better than him. Ami is one such hacker and is the recurring side character/foil that succeeded Lupin's ex-wife Rebecca Rosallini. We witness him truly struggle against the eyes of social media, his attention we thought he craved since he loves sending those calling cards, has become weaponized against him. It's a genius conflict to have and we watch him slowly have the rug get pulled from under him as he has to learn to adapt to his newfound paparazzi like celebrity. Never leaving the hideout without a disguise on after a certain point. This is explored between 2 cours first in the form of a death game, and next as a supercomputer that can predict his every move. The series also has fun in exploring these concepts and it's fun watching Lupin and the gang get the much needed extra time they deserve to flesh out their characterization. They all act like who they usually are, but the times have worn on them a little. There's always this hint of nostalgia you catch on the characters' faces and you can tell they're reminiscing about the more simpler times and it's compelling character writing to add a ironically fresh perspective on characters who realize they're not as fresh as they used to be. The fact the series is broken into 2 cours with 2 separate (to an extent) plots allows the series to move at a brisk pace. even having room for side stories that don't necessarily connect to the main narrative but are still welcomed nonetheless. And as far as the sound is concerned? It's Yuji Ohno...so...it's nothing short of amazing.... The opening is nostalgic with a playful Parisian twist that gets you excited for every episode and the ending is sung by Miyuki Sawashiro (Fujiko Mine's voice actress) and uses footage of Lupin and Fujiko during an unexplored time in their relationship. What could have just been a simple ED is made all the more intimate as it ends up being more of a bittersweet love song about Fujiko and Lupin's breakup. Something that plays a key point in the plot and is used as a recurrent source of tension between the two. It's strange how most series don't incorporate music into their plot like this series does. In the last episode they even cued the famous Samba Temperado from past adventures at the climax and I wanted to tear up at how the series ties up everything about the best parts of this series' history so well. The character designs are sleek and Blue is definitely a great color for Lupin. Jigen and Goemon look great too. Fujiko Mine looks even sexier than before, and might be my favorite version of her character design since she got her own spin off a while back. You'd think background designs would end up suffering from the fact that this is a show about globe trotting super thieves, and the studio would try to cut corners. And these guys animate great too, so as not to make the iconic trio of Zantesuken, .357 Magnum and Walther P-38 not act like simple props. The action has weight and reads easy on screen. Sure there are alot of uses of cut reverse cut here and there. But there's also a crap ton of shots were everyone is in the wide and you just watch people duke it out. Shootouts, car chases and hand to hand combat are stylized and beautiful to watch and with the number of series using CGI in excess it's great to see series use what modern technology can offer anime in less jarring fashion to create some fluid and aesthetically pleasing animation. So if you can't tell, I love this series. Part 5's strongest element is the fact that it knows what made watching these characters fun over the years and instead of trying to change everything out of a need to keep things fresh, or changing nothing in order not to anger the fans, it instead acts like the cast of the show and did whatever they want and had fun doing it. I can't wait for future movies featuring Blue Jacket Lupin, as parts 4&5 have dropped enough cool unused plot threads and explored such new territory with the gang as to leave me clueless for what will happen next. Like that plot twist at the end that makes you question everything about Lupin...you know the one if you've seen it. Go watch it if you haven't already. I know this was just an enthusiast gushing like a schoolgirl at a Bieber concert but that's what Lupin III is to me... it's like being a schoolgirl at a Bieber concert. A subjectively phenomenal experience for Lupin fans, and a solid way to get into the franchise as a whole. I'd recommend starting with Part 4 before this one but I'm sure that those just wanting to get in to the newest iteration won't get lost. This latest installment of the Lupin III franchise adds some new elements to Lupin's thieving adventures that helps freshen up the now 50 year old franchise. First, it explores Lupin dealing with the challenges of modern technology such as the Internet and smartphones. This adds some new challenges for Lupin to deal with as technological elements like hackers, webcams, drones, and social media serve to complicate Lupin's crimes in the modern era. Yet in spite of this and unlike his companions who feel overwhelmed by the changing times at points, Lupin is shown to be quite adaptable in changing technologies and gains a new companion in the form of teen hacker Ami who aids him at a number of points throughout Lupin III: Part V.
The second element that helps make this series a unique one in the Lupin III franchise is that it actually takes time to exploring the relationship dynamics with the members of Lupin's gang. This is quite different from many past installments of Lupin III that mostly focused either on Lupin's thievery, dealing with a worst enemy threat, lusting for Fujiko, or evading Zenigata. With the challenges everyone faces from changing technologies, the members of the gang also come to question what sort of bonds they each have with one another in their connection with Lupin, this especially getting some interesting perspective with Lupin and Fujiko's neverending on and off relationship with one another. This new focus helps to add some new dimension to these characters since older anime fans would mostly identify them from the standard character types they exhibited from past installments of the Lupin III franchise. In regards of plotting, Lupin Part V is mostly similar to Lupin Part IV in that it features ongoing plot developments throughout its entire series run. This series is divided up into several arcs where Lupin and his gang are challenged in some form with whatever big adventure they are involved in revolving the mentioned themes above, carrying a solid balance of serious and amusing moments throughout each arc. With the 24-episode run time, each character has enough time to get their own spotlight of focus throughout the series, this even including series character Ami who gets a fair amount of development throughout the series as she breaks out of her introverted shell. 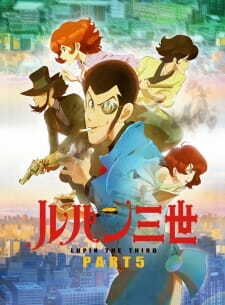 Outside of the series arcs, Lupin: Part V also has the occasional episodes serving as buffer between arcs that have the tone of the episode be similar to that from past Lupin III TV anime, serving as a homage of sorts to past Lupin III works as long-time fans of the franchise can pick up on what series is being portrayed through the color of Lupin's jacket. Overall, I was quite entertained with what this latest addition to the Lupin III franchise had to offer. It added in some new story elements that helped freshen up the franchise's typical story formula, while retaining the ongoing story developments offered from Part IV and having the occasional episode serving as a homage to past Lupin anime. If you've been a longtime fan of the Lupin franchise, this is a definite recommendation I would suggest you try to watch at some point. The famous Lupin's gang, 50years now, after 3 years came back with a new series. The first introduction story presents a new character and probably the most infurious hunting of the most famous thief in the world, Lupin III. Τechnology seems to be one of the most dangerous enemies. Lupin follows italian fashion and wears the blue jacket one more time. Part 5 doesnt have the same story line as the previous part in Italy, arcs with 5 or 6 episodes, flashbacks and from the first moment give us the feeling that going to be more emotional than ever. Characters' relationships are strong, often recollect moments from the past, joking about their age and in addition to their struggle they have with texhnology recall ages when their life wasn't that hard. Ami was a fresh addition and strengthen the sentimental atmposhere with many intense moments. Νevertheless, the strong point of the cage is the interaction Lupin has with Fujiko. Their relationship is more fragile as ever, Fujiko on surface is cynical but romantism overflows everywhere and their feelings are stronger than ever. Some stories were great some not that much, aesthetic was on the point with a great effort also considering the small budget studio has but when the final story came out nothing else matters. Needed e few minutes to make the series one of the most important things to me, Lupin-Jigen dialogue, impact of the feelings right there gives me goosebumps every time when i think about it. Goemon and Zenigata have their moments too, with a fantastic episode when Zenigata-Lupin role is reversed and times when Goemon-Lupin relationship becomes sensible and ready to break. In these opening weeks of the Spring 2018 anime season, Steins;Gate 0 starts off as the by far highest rated anime, although Megalo Box is the new heavy hitter if we look past sequels. This and more in the opening edition of The Seasonal Quarterly.